Is Burning Man an Idealized Silicon Valley? As gorgeous photos from this year’s Burning Man festival flood our social media feeds, way-weary burners may start to ask what it all had meant and if the annual festival holds some greater significance for the larger tech community. Fortunately, several thinkers have already come up with some interesting answers. “Which is why he thinks Burning Man can be described as an open-source, cloud-based, culture,” he said. After all, Burning Man’s creative community can be seen as a massive nexus of scattered individuals, who throughout the year exist in their separate environments, intermittently running local instances of a larger central event… And Engle explains on the podcast that each of these local subcultures is optimized for specific features — like so many different builds of Linux. Turner notes that while Google lets its employees spend 20 percent of their time on personal projects, its managers have also “promulgated relentlessly an ethos of benevolent peer production among them.” There are open email lists and databases of ideas, as well as collaboration-optimized meeting spaces — a philosophy which even recurs in the way Google invites the wider community of internet users to beta-test their software. In fact, there are so many cultural similarities that Burning Man could be seen as an idealized version of Silicon Valley, one where all the dreams of a career in tech finally come true. Google News was famously created in 2001 when an employee shared their personal project, a script for crawling news sites and clustering it by topic, an event Turner calls it an example of “commons-based production.” But for one week at Burning Man, everyone has the same opportunity. And that experience lets them “redeem the failures” of the marketplace, according to Turner, in a ritual space “in which the same sorts of engineering projects that organize participants’ work lives in the everyday, secular world induce feelings of effervescent, even sacred, community. In the process, it suggests to its participants that engineering can remake the world for the better. There’s definitely some cross-pollination happening — though no one’s exactly sure what it is. 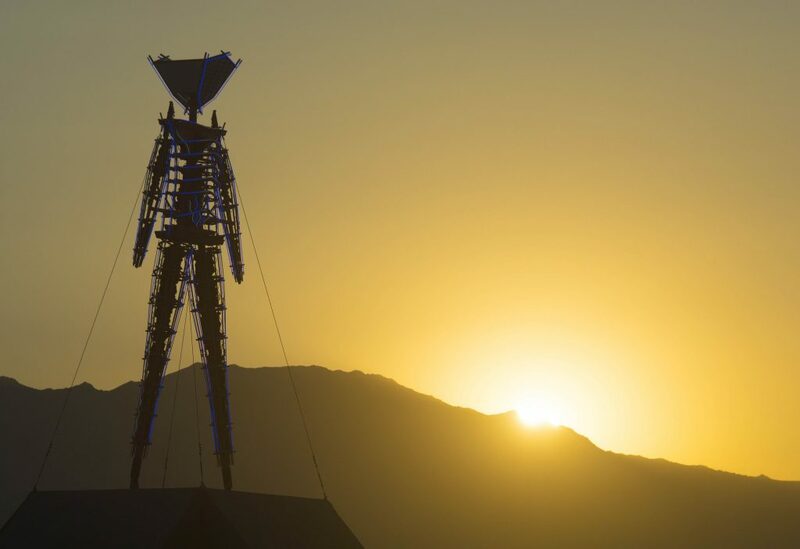 TechCrunch’s Jon Evans notes that Mark Zuckerberg once “choppered in and spent an afternoon giving away grilled cheese sandwiches,” while Elon Musk “dismissed the TV show Silicon Valley because it didn’t reflect the side of the Valley he saw at Burning Man.” Turner lists more famous tech titans who attended Burning Man — including Jeff Bezos, EFF co-founder John Gilmore, and of course, Sergey Brin and Larry Page of Google. But the influence doesn’t end there. “I’ve seen Burning Man-like language infused in corporate statements, where tech workers are often described as ‘entrepreneurial team members’ who work ‘intensely and ecstatically’ on building something that will ‘change the world,'” Turner tells Stanford News. But you have to admit that several projects embodied some truly impressive feats of collaborative technology. Someone even commissioned post-graduate students at Purdue University to build an 80-foot-tall flamethrower that spits 100-foot flames into the air. The contrapation — which ejects liquid propane — took over six months to build, and its creators now plan to take it to more events in the future.. Reportedly a Cisco engineer helped build the Hexatron, a 90-foot wide forest of 468 LED light poles — each one 20 feet tall and controlled by a computer. And of course, there was a swarm of over 600 drones. But whatever its greatest significance for the larger world of technology, 70,000 people collectively transformed an empty space in the desert into something greater — a communal experiment in fun and fellowship. And it looks like they all had a blast. Silicon Valley now has self-driving cars that deliver groceries. Can starfish-killing robots save Australia’s Great Barrier Roof? The American women who cracked Soviet spy codes during the Cold War. After 24 years someone unlocks the final secret in Doom 2. IRC-loving geeks make the case against Slack. Actor John Turturro’s 1999 video explaining the web. Remembering Microsoft’s attempt at an online service competing with AOL. Feature image: Bureau of Land Management, Creative Commons license.